Welcome to the website for actor Ben Youcef. "I was born in Algiers on The Mediterranean Coast into a family of 7 children. Fighting for attention among my brothers and sisters was probably where my acting career really began. My objective as an actor is to bring a new understanding of the Middle Eastern culture to the rest of the world. My life integrates the Islamic spirit with modern energy. I still retain an almost naive way of seeing the world that comes from a truthful place of a kid that was me." Discovered by Steven Spielberg in MUNICH, this theater trained actor studied in London before working as a top model in NYC for leading designers and advertisers. After moving to LA he played Guest Leads on LAW & ORDER, CSINY, NCIS:LA, CHICAGO P.D.. He co-starred in FROM THE ROUGH opposite Taraji Henson and the late Michael Clark Duncan. Based on a story he wrote Ben produced and starred in THE ALGERIAN that he won BEST ACTOR for at the Downtown LA & London International Film Festivals. The son of a diplomat Ben speaks fluent Arabic & is the lead Arabic voice for CALL TO DUTY, MEDAL OF HONOR and X-MEN: APOCALYPSE. He is considered the go-to consultant & voice-over expert for all five Arabic dialects in both major film and television productions. After deep and meaningful discussions with Steven Spielberg Ben volunteered to be an active member with a non-profit Inter-Faith group of Jews/Christians/Muslims in LA. and an online video of his Call to Prayer has gone viral worldwide with over 20 million views on YOUTUBE & NPR followed with a related segment on him contrasting his Interfaith life with his life as a Hollywood actor. As a result Oscar winning composer Philip Glass asked Ben to join him at The Hollywood Bowl in front of 18,000 to perform the Call to Prayer in "Powaqqatsi." The Los Angeles Times review called his performance "…uniquely moving and important." After being interviewed on Swedish television the International Press praised Ben for his ability to "captivate people with his extraordinary charisma and talent." Most recently Ben has collaborated with James Franco on several interesting independent films while continuing to work on his craft with the Tony Award winner Paul Sand. Below is an excerpt from a review of the NBC series episode "Law & Order: Great Satan" guest staring Ben Youcef. Ben Youcef delivered probably one of the best guest appearances of the year, if not the best. Characters like this only get less than an hour to develop before our eyes, but Sameer Ahmed really got the chance to shine and grow from an immigrant caught up in a world of crime to doing the right thing. Perhaps it was his voice that provided a sympathetic twinge for his character, but you really felt sorry for this guy in the end. 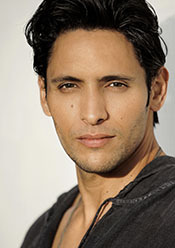 ...we hope to see Ben Youcef in other films and shows. Below is a quote from The Jewish Journal about Ben Youcef leading the prayers before 1500 Jews, Muslims and Christians at the Southern California Islamic Center. Several Jews migrated over to the prayer room and lined up as the prayer leader led the worship. It was the full-on experience -- standing, kneeling, bowing -- just what you see on the evening news but with, yes, some Jews and Christians sprinkled in. I mentioned to a woman standing nearby that the young man leading the prayers, Abdelwahab Ben Youcef, was almost unnaturally handsome. "Oh, he's an actor," she said. "He played one of the Palestinian terrorists in 'Munich.'"